This beautifully updated two bedroom/two bath condo at The Villas at Walton Creek has been lovingly cared for since we purchased it new in 1998. Comfortably accommodating 4 - 6, we recently finished some extensive upgrades, including replacing the tired old carpet with new hardwood flooring and new slate tile in the main areas, adding new carpet in bedrooms, new quartz counters, stainless appliances and canister lighting in the kitchen, and remodeling both bathrooms. We've made sure the condo has everything you need for a winter or summer holiday! The complex includes an outdoor hot tub for relaxing after a hard day on the slopes or on the trail. Conveniently located close to the Gondola base, The Villas is only a short walk along a scenic creek-side paved path that takes you to the gondola, ski slopes or summer hiking in just a 10 minute walk. A ride on the free bus (available every 15-20 minutes) gives quick access to the slopes, nearby restaurants and grocery stores. Shops and other activities in downtown Steamboat Springs are just two miles away on the same bus route. Regularly scheduled HDN and DIA airport shuttles pick up and drop off guests right at our door so you don't need to even have a rental car. The unit is a spacious 1,087 square feet on the 2nd floor with a private heated garage/entrance below. There is a fully-equipped kitchen with new stainless steel appliances, charming log queen bed in master bed-room, bunk bed in the second bedroom (full-size bed on bottom, twin on top) down comforters for all beds, and queen pull-out sofa in the living room. Sunny decks are located off both the living room and master bedroom with views of the ski area and the Flat Tops. You'll have many moments of tranquility just looking at the magnificent views. A gas fireplace in the living room will be welcome after a day on the mountain. Other conveniences include a barbecue, tables and chairs on the decks, two color TVs with HD cable, 40' LCD HD Flat screen in living room, Blu-ray DVD players, Bose iPod sound dock, board games, Free high speed wireless internet, and hot tub on site. This is a quiet complex with only 6 units per building. Private heated single car garage with mudroom and staircase entrance. There are many resident owners, making this a great location for families. Includes stackable washer and dryer. Additional towels and linens, as well as housekeeping are provided. There may be a cleaning fee for four nights or less. 4 night minimum stay during the winter season please. Located on FREE Walton Creek bus route to gondola and downtown. This is a Smoke and Pet free condominium. We lived in Steamboat and met here many years ago. Steamboat has been a part of our lives for over 30 years. This is our only rental property, and it is also our home-away-from-home. Steamboat is a special place for us, and for our kids as well. This property is just the right size and location to enjoy the area and everything it has to offer. 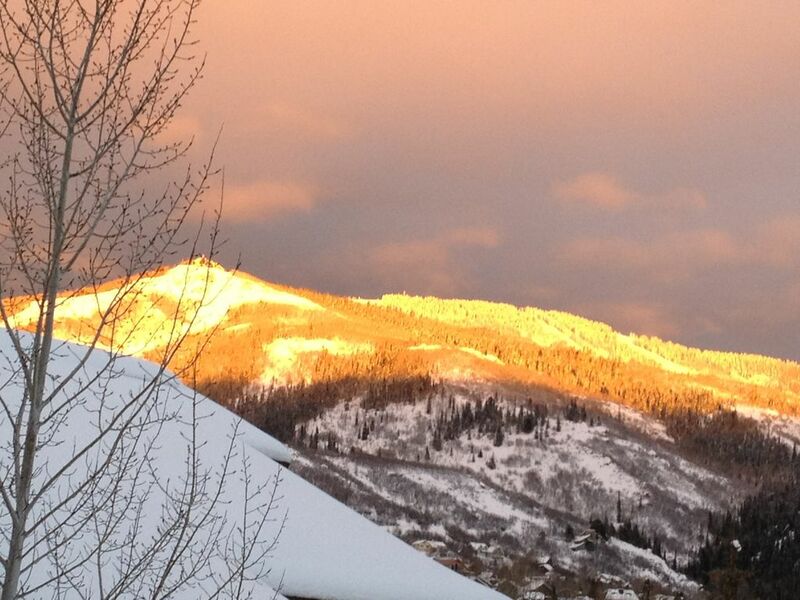 We love it in all seasons...there's always something in Steamboat that will take your breath away. Wonderful people! Plus the best skiing, biking, hiking, fishing, and camping. Don't miss the Strawberry Park hot springs in winter or summer. Located at the base of Steamboat Ski Area, the condo is a short walk or complimentary bus ride from the Goldola. You'll be skiing in minutes! Living room faces the west side of the ski mountain, with view to the summit. Master faces the Flattops wilderness. Direct interior entrance from garage to condo -- avoid shoveling! Book case with 100 fiction titles - leave one/take one! Would definitely stay here again. Kitchen is well-equipped and entire unit is nicely furnished. I have two constructive comments. One, it would be nice if there was olive oil and at least some coffee in kitchen. Second, the bed in master may need to be replaced. Neither my wife nor I are big and the bed is concave, so kept rolling us to the middle and it’s uphill to get out. Made for some good laughs. Thanks for the comments, We will get the mattress replaced this spring. A great location; clean, quiet & comfortable. Love the two decks; plenty of choices for morning coffee! A great (and easily accessible) location, and a great spot to return to after a busy day in the mountains. We have been coming to Steamboat for many years, and this condo is an instant favorite. Communication with Gregg was always both quick and easy. We will not hesitate to come back; really could not have been better. Very clean with everything we needed. Great location for Steamboat ski vacation. Property was in great condition, fully equiped and close to ski area. Owner provided plenty of information and always replied quickly. Wonderful space in the home and love the balcony! We loved staying at your home! It had a wonderful living area/kitchen that we enjoyed sitting around and visiting with our friends. Loved the balcony to just sit, relax and drink coffee. Clean, cute and so comfortable to stay in! Wonderful condo well equipped, Great location, quiet location. Snowshoeing, biking, hiking from site, as well as local hot springs, hot air balloon rides, sleigh rides and snowmobiling.